I seem to have been remiss on keeping up with my blog, not that I really had any expectations of myself in terms of how often I planned to post (life is just less stressful that way!). Actually, I thought I'd write up a post about babies and sleep, because Z's naps have been a little crazy lately. I have done a LOT of reading on baby sleep. I think the feeling is mutual among mothers when I say that I am highly motivated when it comes to doing what I can to help my little one sleep well. Babies develop so much during that first year of life, and sleeping is when so much of that growth (mental and physical) occurs. Of course, my sleep is tied to his sleep, so that's part of the motivation as well! I really feel this is the best resource EVER for parents with children of any age looking to improve their child’s sleep. The author is both a pediatrician and a sleep researcher. The language direct and to the point, which some parents might find off-putting, but I find refreshing. The book is a mix between explanation of sleep stages and information based on the results of research, case studies, and troubleshooting for common sleep problems. I like this book so much, I would actually consider including it in future baby shower gifts. 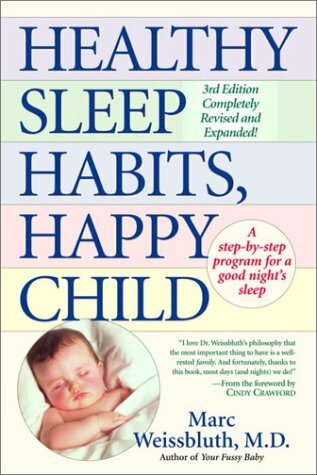 I really agree with Dr Weissbluth’s emphasis on the importance of helping your child establish healthy sleep habits. This review really embodies why I love this book. First off, I find this title a bit presumptuous, even IF the author has found mass success with her methods. Regardless, I have found that some of her methods have worked for me (some with immediate results!). This book is also nice in that the author covers not only sleep, but also temperament, feeding, and potty training. I seriously don’t know how this is the empire that it appears to be. I swear the contents of this book could be adequately contained in a brochure, which was actually a plus when I read it in a sleepless-haze, madly searching for any way to help settle my baby in our first month home from the hospital. 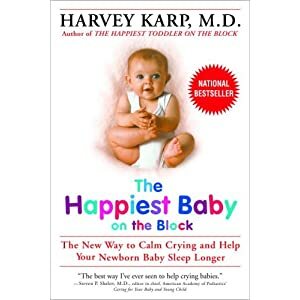 I certainly would not suggest this book for long term advice on helping your baby sleep, but I did find the author’s five S’s to be immensely helpful in settling my little one to actual SLEEP during those first few weeks. I won’t list them here, as I don’t want to infringe on any copyright protection that might exist. If interested, you should be able to find the relevant information on the author’s site here (though the book was a nice easy read). Beyond books, I have also found many websites helpful, including (but not limited to) http://www.babysleepsite.com/. because they may not get there on their own. I know this may sound a little cryptic (and definitely not eloquent). I think a good example is when Z was still very young (we’re talking a month or two old), he would only fall asleep on a person (myself or my husband usually) and then would have to be moved carefully into his crib. I remember saying to my husband that one day I would love to put Z down awake in his crib and walk away and have him fall asleep on his own. I mean, how great would it be for him to learn how to help himself fall asleep! My husband literally laughed at me and said he thought it was a pipe dream. Well, for a good few months now (and Z is just shy of 6 months old), I have been putting him down awake and he falls asleep on his own! It took some reading, and a number of steps to get there, but we got there! I think the other piece of advice I would give is, take everything with a grain of salt, and (as my mother often tells me, and I in turn tell her) don’t forget to give yourself some grace.